Previously, long-pressing a notification would offer a link to the app info page of any app that produced it. With Android 5.0 Lollipop Google is improving this functionality. Simply long-press and you get the app name and icon, as well as a link to the app notification settings. Look at how wonderfully hypnotic the animation is. 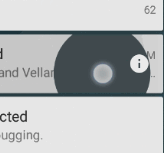 So simply long-press to get the app name, time the notification was generated, and a link to notification settings (the button on the right). Another long-press wipes back to the regular notification. It also works when notifications are expanded. This is a faster way to see which app is doing what, rather than tapping and heading into the info menu each time (like in older versions). This is a cool example of how the new animations in Android 5.0 make the experience feel more responsive and polished. Now if you'll excuse me, I have to play with these notifications for another hour or two.